Established in 1929, FRIM or the Forest Research Institute of Malaysia in Kepong, Kuala Lumpur is a leading tropical forestry institute. 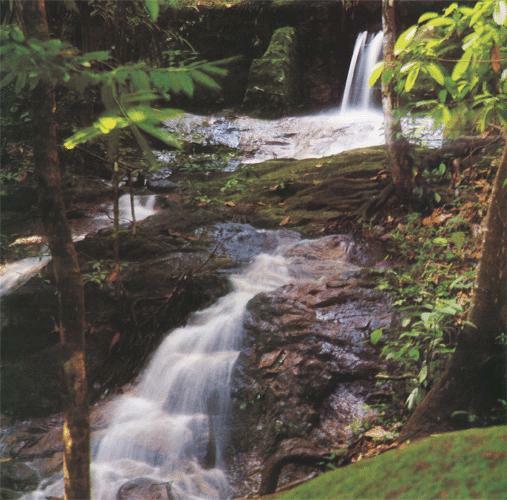 Covering 600 hectares, the FRIM tropical forest contains a vast array of flora and fauna with approximately 15,000 species of plants. However, there are not any ayahuasca for you to drink. Forest Research Institute of Malaysia is like a gigantic arboretum, and it's truly breathtaking. If you're not a botanist, or even if you ARE a botanist, you had better pick up the brochures that you can find at the entrance to this place so you can maybe feel slightly intelligent as you come across the different trees and plants and critters. This isn't rocket science, after all. So if you're just a rocket scientist you might feel pretty stupid in the FRIM without those name-dropping brochures. If you part with a little coin, you can buy the right to walk in the 200m canopy walkway suspended 30 meters above the ground on the tree species of Chukrasia tabularis, Intsia palembanica, Artocarpus elasticus and Shorea pauciflora. Up there, you can clearly hear the wind and the cicadas gently singing. If you have a phobia about heights, this is not recommended. FRIM has a waterfall where you're allowed to frolick in the catching pool. Skinny dipping, however, is frowned upon. Now, remember, this really IS a little tropical forest. There are insects and there aren't any gift shops. We Malaysians have a saying; "Keep it real." So come appropriately dressed, fed and packing the bug spray. When it comes to insects in the tropical forest, we Malaysians have another saying; "Kill 'em all and let God sort 'em out." Please don't quote me on that! 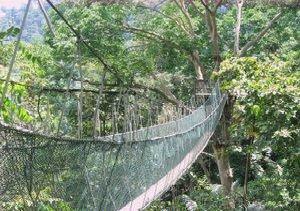 The Keruing Trail and the Salleh Nature Trail are the two most popular paths through the FRIM. 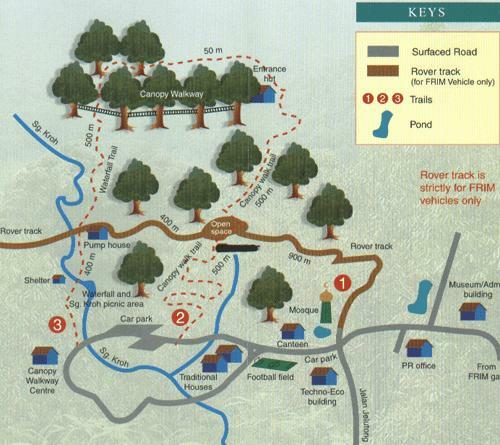 But there are also the Rover Track and the Engkabang Trail if you want to be different. This is where you really want to whip out those brochures and impress your girlfriend. (The best way to do that is to leave her home, take your cell phone, then call her and read off the flora and fauna names in the brochure as if you know exactly what you're talking about.) If you walk to the Keruing, be sure to notice the big giant bamboo trees. Please be advised that if you are a Panda, you're not allowed to eat them. You're also not supposed to make flutes or quarter staffs from them. At one point you'll finally look up and notice the "puzzle-like" pattern of the individual tree crowns as they are separated by gaps and outlined against the sky. 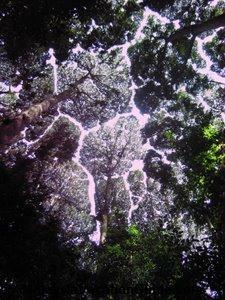 They call this the "Crown Shyness", although they probably mean the "Shyness Crown". The trees, called Dryobalanops aromatica or kapur trees, appear to be shy towards their own kind and so they form the gaps that let you see the sky. Clever, eh? Now, if you're really adventurous, you can secure permission to camp out overnight in the Forest Research Institute of Malaysia. Who knows? Maybe you'll have a shamanic vision if you do.